In 2009, South Africa initiated and led a process that saw the United Nations (UN) General Assembly designating 18 July as Nelson Mandela International Day. It was decided that the General Assembly would annually observe this day in a special session. On 18 July 2013, the former South African President and anti-apartheid icon celebrated his 95th birthday. 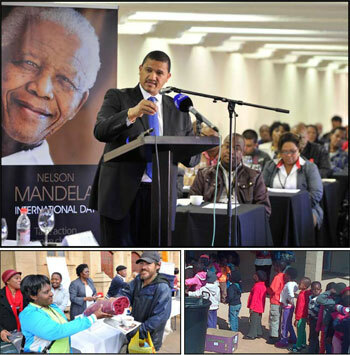 Global celebrations and charity events were held under the theme: “Take action, inspire change, and make everyday a Mandela Day”. “Nelson Mandela gave 67 years of his life to the struggle for human rights and social justice. In marking this day, the United Nations is joining the Mandela Foundation in asking people around the world to devote at least 67 minutes of their time on 18 July to community service,” UN Secretary-General Ban Ki-moon said. This year also marks the 50th anniversary of the Rivonia Trial – a seminal event in South Africa’s liberation. 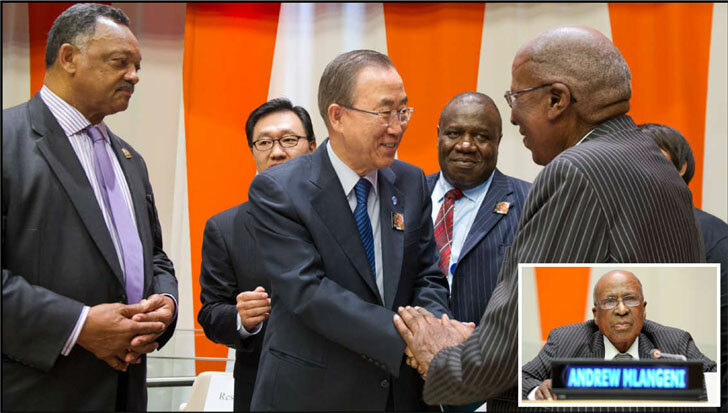 On invitation by President Zuma, struggle veteran Andrew Mlangeni, a comrade, compatriot and fellow Rivonia trialist of former President Mandela represented the Government of South Africa at the special sitting of the General Assembly as the keynote speaker. The speakers included Secretary-General Ki-moon; the President of the General Assembly, Vuk Jeremic; former President of the United States, Bill Clinton; and legendary musician, Henry Belafonte. Nelson Mandela, who led the country to democracy in 1994, left office in 1999 after serving one term as South Africa’s President. Seen as South Africa’s moral compass, the highly-revered leader announced his retirement from public life in 2004, but continued to make a number of public appearances. The former South African President has received more than 250 awards over four decades, including the 1993 Nobel Peace Prize. Seventy Department of International Relations and Cooperation (DIRCO) officials were deployed through voluntary participation to take part in 67 minutes of community service. The officials visited Ya Bana Village for Children in Winterveldt in the north-west of Pretoria, the Boitumelo Community Centre in Soshanguve and the Roman Catholic Cathedral Church in Skinner Street, Pretoria, where blankets and soup were given to the homeless. The Ya Bana Village is home to 25 children, divided into multiple houses identified by different colours such as red, green, yellow and blue, and each house has six to eight children living in it. A house mother is also allocated to each house; which provides a homely feel and breaks away from the traditional orphanage setting. A fence divides the houses where the young kids are living, and the houses where the older boys are staying. 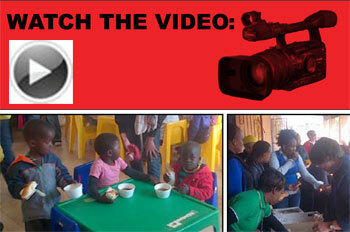 During lunch time, DIRCO officials served buns and soup to the children. This was the third time South Africa hosted this annual summit, having done so previously in 2009 and 2011. On Nelson Mandela International Day, 18 July, a day on which humanity honours the legacy of Nelson Mandela and his values through volunteering and community service, South Africa hosted the Sixth Session of the South Africa-European Union (EU) Summit in Pretoria. 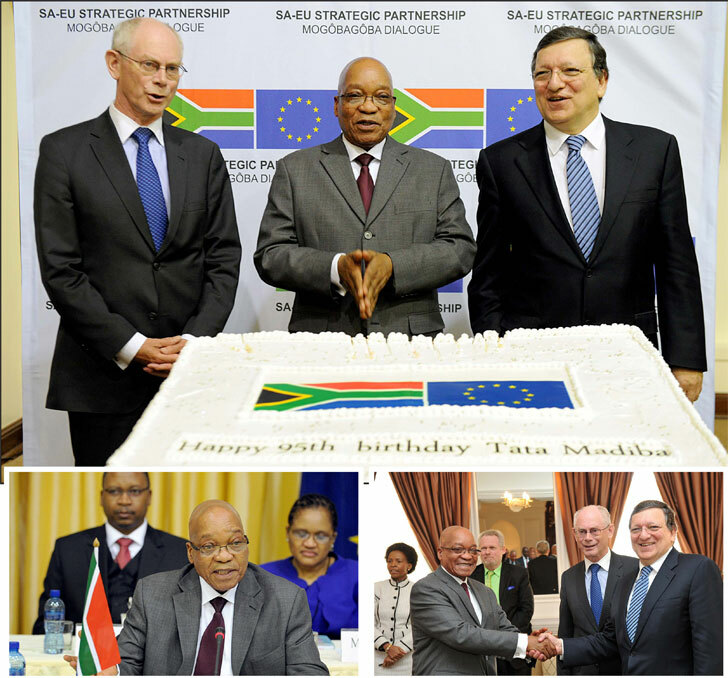 South Africa’s relationship with the EU has traditionally been strong, even before the signing of the bilateral Trade, Development and Cooperation Agreement (TDCA) in 1999. Many of the European partners were ardent supporters of the anti-apartheid struggle, offering support financially and also in kind. The TDCA, which represents the formal manifestation of this partnership, is the most comprehensive developmental framework that the post-1994 democratic State entered into with a trading partner. The agreement helped to accelerate the integration of South Africa into the global economy. The establishment of the Strategic Partnership with the EU in 2007, expanded the scope of the interaction beyond trade issues, to incorporate a much wider scope of cooperation. To date, this includes cooperation in the areas of customs, science and technology, information and communications technology, space, maritime transport, migration, education and training, health, employment and social affairs, energy, and environment and sustainable development. Since 2004, South Africa has been a generous beneficiary of development assistance form the EU through the Development Cooperation Instrument. For the period 2007 to 2013, €980 million (R12,7 billion) was allocated to South Africa to support priority sectors, which includes support for primary education (€123 million), primary healthcare (€126 million) and the employment creation fund (€120 million). The importance of the EU does not only relate to development cooperation, but also to trade and investment. The EU, as a single customs area, remains our largest trading and investment partner. The EU foreign direct investment (FDI) stock in South Africa comprises 77% of South Africa’s total FDI stock. The summit afforded participants the opportunity to discuss some of the bilateral trade issues such as South African citrus products in the EU market. Views were also exchanged on the current state of play vis-à-vis the Southern African Development Community (SADC)-EU Economic Partnership Agreement (EPA) negotiations. New cooperation in the areas of maritime security and human rights. SA-EU Business Council to be established. Possibility to establish an Employment and Social Affairs Dialogue. Agreed to work together to define a programme of specific actions in a number of areas to reduce youth unemployment, such as possible twinning arrangements between colleges in South Africa and EU institutions. Agreement reached that SADC EPA Group-EU EPA negotiations be concluded shortly. Welcomed the new R1,3-billion/€100-million planned programme to blend grants with loans from the Development Bank of Southern Africa and European development finance institutions to support South Africa's infrastructure programme. Agreement reached to develop a joint cooperation programme with a focus on rural electrification through renewable energy solutions. Welcomed plans to establish a SADC centre of excellence for renewable energy and energy efficiency and encourage an early completion of the preparatory work with the assistance of EU partners. Welcomed the signing of the agreement between South Africa and the European Atomic Energy Community for cooperation in the peaceful use of nuclear energy. It will enable common work between South Africa and the EU on nuclear safety in the context of implementing the African Nuclear Weapon Free Zone Treaty (Treaty of Pelindaba) on non-proliferation and on the peaceful uses of nuclear science and technology. Agreed to work together in the G20 to find solutions to structural unemployment, especially among young people, and to promote job creation, entrepreneurship and investment. The Africa-EU Summit will be held in Brussels from 2 to 3 April 2014. The Seventh EU-SA Summit will be hosted by the EU in 2014. South Africa returned to international chess, one of the first sporting disciplines the country played at international level, on 7 June 1992, when it played against Argentina in the Philippines. 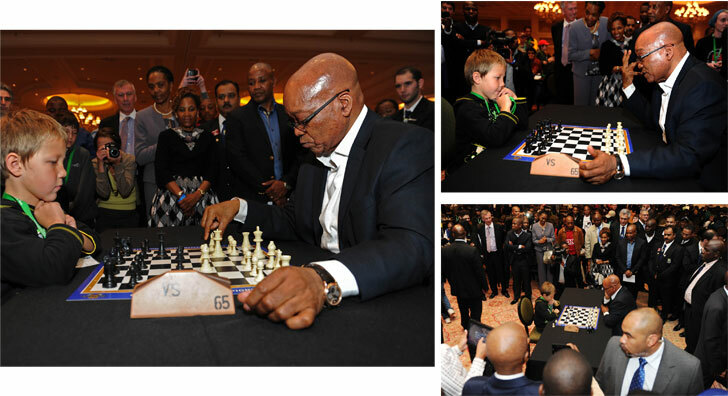 On 14 July 2013, President Jacob Zuma addressed the 2013 Commonwealth and South African Open Chess Championships, which were held from 5 July to 14 July at the Boardwalk Hotel, Conference Centre and Spa, in Port Elizabeth, Eastern Cape. Eight hundred players from 29 countries, which included eight grandmasters, six women grandmasters and 13 international masters, participated at the event. 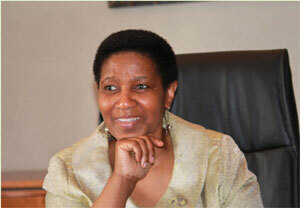 President Jacob Zuma has congratulated former Deputy President, Phumzile Mlambo-Ngcuka, on being appointed as the Executive Director of UN Women, an international agency of the UN, promoting equality for women. “On behalf of government and the people of South Africa, we congratulate the former Deputy President on this crucial appointment. It is a true measure of recognition not only of her contribution to the advancement of women in South Africa, but also an acknowledgement of the considerably influential and progressive role that South Africa and its people continue to play in global affairs,” President Zuma said. UN Secretary-General Ban Ki-moon's spokesperson, Martin Nesirky, was quoted by media as saying Mlambo-Ngcuka brings to this position a wealth of experience in advocating for women's issues with a combination of strategic leadership, consensus-building and hands-on management experience. 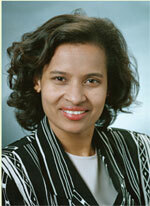 Former South African Minister for Public Service and Administration, Geraldine Fraser-Moleketi, will be joining the African Development Bank. Moleketi, who is currently the Democratic Governance Director in the United Nations Development Programme's (UNDP) Bureau for Development Policy has been appointed Special Envoy for Gender at the African Development Bank. She will be leaving the UNDP at the end of August. The Egmont Group was formed in 1995 to provide a platform for financial intelligence units to improve the coordination and exchange of financial intelligence and support national anti-money laundering and anti-terrorist financing programmes. South Africa's financial intelligence head, Murray Michell, has been appointed to chair the Egmont Group, an international organisation tasked with combating unlawful financial activities. Michell, who heads the Financial Intelligence Centre (FIC), was announced as the new chairperson during the 21st Egmont Plenary meeting held at Sun City, North West, recently. The FIC collects and analyses data sourced from reports submitted by accountable and reporting institutions and provides the analysis to law enforcement authorities and the South African Revenue Service to follow up. www.southafrica.info. The Stop TB Partnership Coordinating Board has elected Aaron Motsoaledi, the Minister of Health of South Africa, as its Chair. “As South Africa’s Minister of Health, I am fully committed to achieving our vision of zero TB deaths and zero new TB infections. But I am also convinced that the only way to stop TB, both nationally and internationally, is through partnership,” Minister Motsoaledi said. Since joining the Stop TB Partnership Board in 2010, Minister Motsoaledi has played a key role in pushing TB up the political agenda. 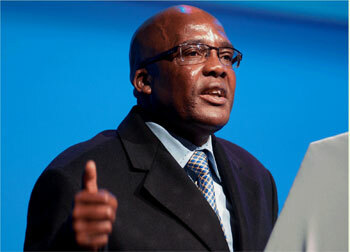 Together with health leaders from Lesotho and Swaziland, Minister Motsoaledi brought the issue of TB in the mining sector to the attention of the Southern African Development Community (SADC) leaders in 2011. These efforts resulted in the signing last year of the SADC Heads of State Declaration on TB in the mining sector. In April 2012, Transnet announced the details of a R300-billion investment in infrastructure aimed at creating over half-a-million new jobs while making its freight rail division the fifth-largest in the world. 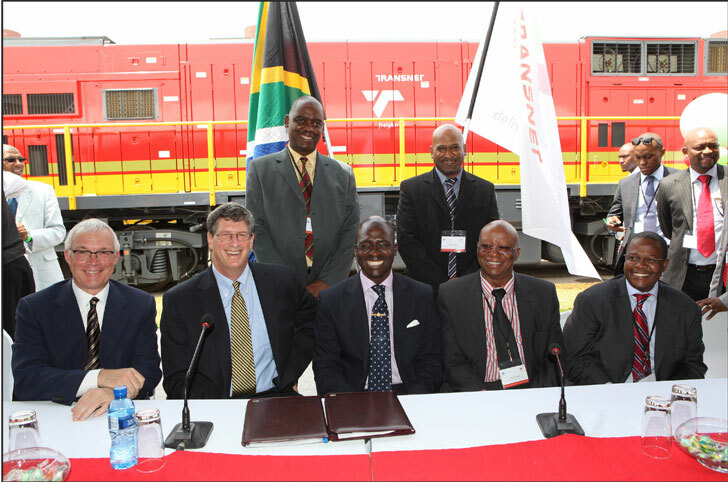 South African state company Transnet has secured US$108 million (approximately R1,1 billion) in financing from the Export-Import Bank of the United States of America (USA) to support its purchase of 53 locomotives from US company General Electric (GE) Transportation. The grant follows Ex-Im Bank's approval in February 2011, of a R1,1-billion loan to Transnet for the purchase of 47 locomotive kits from GE, adding up to a total of $230 million in financing for the purchase of 100 GE locomotives. Ex-Im chairperson Fred Hochberg, referred to US President Barack Obama's recent trip to South Africa, and said: "As the President highlighted on his recent trip, there are enormous opportunities for USA exporters in South Africa and across the broader region." The bank, which provides below-market financing to facilitate sales of US goods abroad, would "continue to help American companies expand their reach into this dynamic market," Hochberg said. Transnet plans to spend the lion's share of this capital investment, R205 billion, on rail projects – R151 billion of this on freight rail – as the company pushes to increase South African freight rail volumes from about 200 million to 350 million tons by 2019. South African automotive parts supplier Feltex and Luxembourg-based International Automotive Components (IAC) have formed a joint venture in East London in the Eastern Cape. 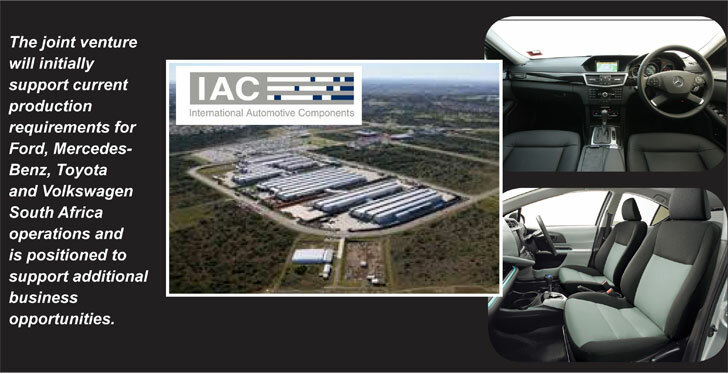 The venture, called IAC-Feltex, marks the IAC's entry into the growing South African automotive sector, which is predicted to increase annual passenger car production to 600 000 units by 2018. The venture entails that IAC will provide design, engineering and manufacturing expertise for vehicle interior components and Feltex will provide product and process expertise. The deal forms part of the IAC's expansion plans into new and emerging markets and follows joint ventures in Malaysia and Thailand, the opening of a greenfield manufacturing facility in Romania, a sales and engineering office in South Korea and its 11th plant in China. The IAC Group operates 79 manufacturing facilities in 18 countries and a total of 90 locations in 20 countries around the world. Feltex has manufacturing plants in Durban: Rosslyn and Ga-Rankuwa in Pretoria: Port Elizabeth: and East London and supplies products directly and indirectly to South African original equipment manufacturers.